My apologies to all my subscribers for not pushing out any blog posts for almost the last three weeks. First, a family trip to Europe where we met up with our son, Michael, who spent the last month studying in Prague through a program sponsored by the University of Missouri-Columbia. His studies were over when we arrived and we began our journey by touring Prague and then made our way to Vienna, Salzburg and Munich. We got home very late on a Sunday night and on Monday, I took off to Las Vegas to attend the Licensing Expo where Snotes had a great booth and met with all sorts of potential new licensing partners. Oh yeah, we got a new puppy on Saturday. Definitely more details to follow. So that’s where I’ve been and why I’ve been away from the blogosphere. And I’m ready to roll. Besides being an owner of my own advertising/marketing agency, I have two main hobbies: golf and painting. I love doing both though it seems that this year, my golf skills are in the deteriorating mode. Painting on the other hand, is getting slightly better since I picked it up again a little under two years ago. Since that time, I’ve done 18 different paintings. That brings the total number of canvases in the Blood household to somewhere around 60-70 paintings. Long ago, when I had several gallery showings I sold about 12 paintings overall. I have never painted to earn a profit. I paint because I can and something tells me it’s a talent (miniscule though it is) that I shouldn’t let go to waste. At the same time, all these paintings sitting around in our house, many consigned to the storage area of our basement where they sit around collecting dust really aren’t doing anyone any good at all. So recently, I’ve been trying to up the ante to put a little more effort into selling some of my works. I joined ArtLoupe, which has been very good to me, showcasing a number of my paintings via their tweets. ArtLoupe is an app that’s a free download for your phone https://itunes.apple.com/us/app/artloupe-buy-and-sell-fine-art/id1027498940?mt=8 and it features new artwork daily. I have quite a few paintings on display but I’m not quite sure how to find me. Maybe you can figure it out. It made sense to use BloodLinesArt as the name of the website. Eventually, it will link back to BloodLinesCreative.com and even though the two are separate, they’re still related. I really like this new site, especially when viewed from my mac. If you take a visit and click on ‘Works’ you can see a lot of my paintings. Click on View all and the entire roster loads on the page. Then you can click on any one of them and they come up on screen nice and big. I really like my “Nuts and Bolts” image on the site – the photography shows up amazingly well and you can see what a strange piece of art this really is, featuring hand painted nuts and bolts embedded into a sea of blue. All but two of the pieces are listed as being for sale. To date, no inquiries though I plan on adding an e-commerce element to the site later on and I’ve also been contemplating turning some of my paintings into t-shirts and other assorted wearables or offering posters of them as well. All in an effort of doing a little house cleaning. In the near future, I also plan on contacting a number of local galleries and seeing if I can’t convince someone to offer me a show once again. The shows I had back in the early 90s all made money for the gallery owner and for me and I think the same would occur again if given the chance. Art is meant to be seen and enjoyed and from what I’ve been told, people really enjoy my art once they see it. We just don’t get a lot of traffic in our basement. It’s been a while since I’ve written about Snotes – not because nothing has been happening but rather, I’ve been too busy working on the account to have the time to blog about it. Snotes stands for Secret Notes. It’s a form of anamorphic messaging that has been around since the days of da Vinci but thanks to a patented technology, allows a user to create a Snote by typing in their message on the Snotes generator that lives on snotes.com and in under a second, your message is magically created – able to be sent via email or posted on Facebook or texted to your friends. 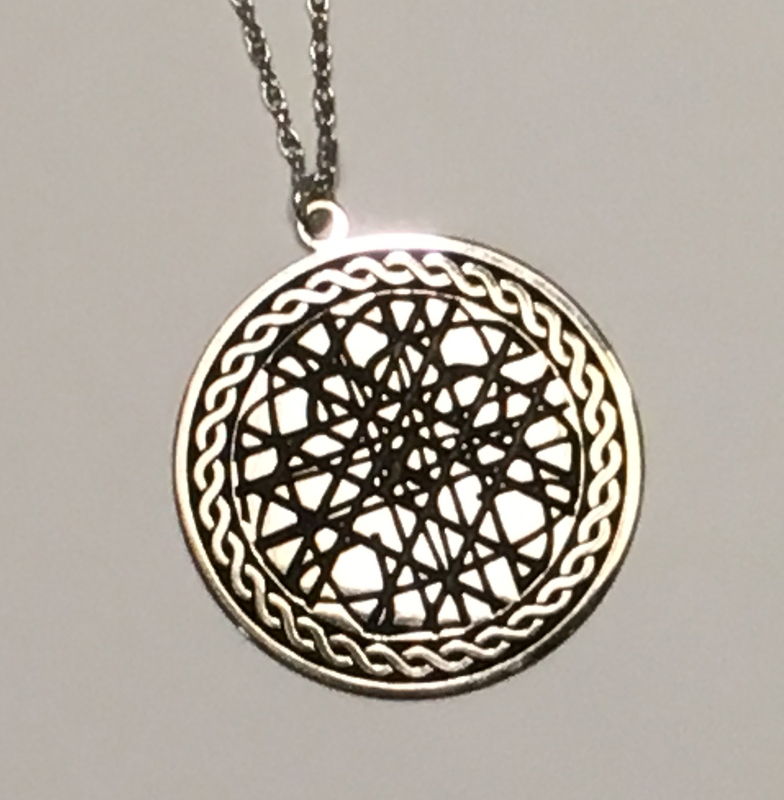 This is an actual Snotes LoveKnots necklace featuring Chris’ initials and mine, intertwined together. The fun thing about Snotes is how many potential uses they have. One such use is shown in the necklace you see above. We call them Snotes LoveKnots and we’re just now beginning to take orders for them. 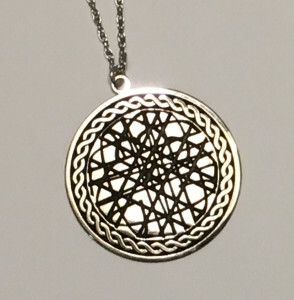 What you see in the photo are four sets of initials – CMB, THB, CMB, THB that are intertwined together and put into a sterling silver necklace. It can also be done in gold and there are a variety of ways we’re working on to showcase the letters – raised, with colored backgrounds and with different borders. It’s exciting for the wearers of the necklace to explain that it’s their initials and their husbands initials. Or maybe the initials of their grandkids. Monogrammed jewelry is a big business in the U.S. – and this is a whole new way to do monogrammed jewelry. We’re not just talking necklaces, either. Snotes LoveKnots can go on bracelets, ear rings, key chains, belt buckles. And that’s just for starters. Imagine a bride and groom using a Snotes LoveKnot on their wedding invitation. And then having it on the napkins, glasses and even the cake at the reception, followed up by Thank You cards and personalized gifts for the bridesmaids and groomsmen with their names and the date of the wedding. If you’re interested in an even wider range of how Snotes might be used, visit http://snotes.com/licensing-opportunities/ and explore our three key categories: Business, Consumer Products and Education. We are truly excited about the potential for Snotes. Teachers have discovered the fun of using them in the classroom for games and quizzes and are making plans on incorporating them into next year’s lesson plans. Our website visitation has been exponentially growing. In about three weeks, we’ll be attending the Licensing Expo in Las Vegas. We have a very cool looking booth that will showcase our full range of Licensing Opportunities. We also have prearranged meetings with some major companies that have shown interest in partnering together that could potentially accelerate the growth of Snotes in ways that might be hard to fathom. Snotes are on the rise. It’s going to be fun to see how this story continues to unfold.